Welcome to Best Thing We Ate This Week, where each week, we'll have a special guest or Thrillist staff member talk about a New York dish they recently tried and loved. This week, Angie Mar, chef-owner of The Beatrice Inn and Thrillist NYC's 2016 Chef of the Year, professes her love for Carbone's tortellini. There's no shortage of great restaurants in New York City, but my favorite is consistently Carbone. I was there last week after I closed up the Bea, at my favorite table -- Table 40, right off the kitchen. There's no better place to people-watch and indulge in some of the city's best pasta. I've dined at Carbone so many times over the past three years and it never fails to amaze me. 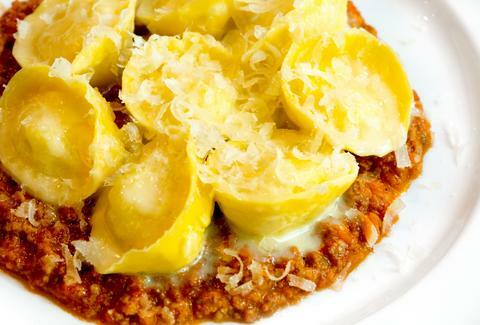 I always get the tortellini Bolognese -- it's so simple in concept but has always spoken to my soul. It's amazingly light and ethereal and almost disappears on your tongue. The Bolognese that accompanies it is savory with depth and richness -- it's a dish with a lot of soul. Nathan Wooden, Carbone's director of food and beverage, is one of my favorites, and when there is tortellini Bolognese, there is never a shortage of Brunello to drink.